ABSTRACT: This paper examines youth engagement in the conduct of the 2015 general elections in Nigeria, against a backdrop of historical experiences. Discounting the doom youth theory of youth bulge, youth in crisis or lumpen youth culture, the article illustrates a paradigm shift in youth engagement in the conduct of elections. Youth engagement in the 2015 elections was more constructive than in prior elections. Within the context of dual motivation theory, the destructive engagement by youth in the prior elections was motivated by the need to change the outcome, whereas their constructive conduct in the 2015 elections was driven by duty to participate in public affairs in Nigeria. This change in political attitude is explained by a growing consciousness of the potential of young people to act as agents of change. This awareness arises through the aid of social media, coupled with the recent success story of the Arab Spring driven by youth, the inflammable repercussions of previous elections, and the high stakes the 2015 general elections held for Nigerian governance. Chika Charles Aniekwe is a former Senior Political/Election Officer at the Democracy and Electoral Assistance Unit, Department of Political Affairs, African Union Commission. Samuel M. Atuobi is a Senior Political/Election Officer at the Democracy and Electoral Assistance Unit, Department of Political Affairs, African Union Commission. 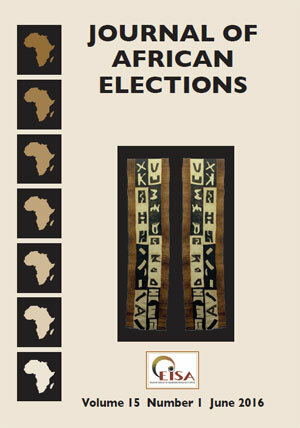 ABSTRACT: Between 1989 and 2013, the African Union (AU) observed 423 elections in Africa. However, these election observation missions were inconsistent at best in terms of approach, methodology, framework and status. The first, which was in Namibia in 1989, was deployed within the framework of the United Nations (UN) statute in terms of which the UN invited the AU. The subsequent election observation missions have to date been deployed either as diplomatic or mediation missions or a combination of diplomatic and independent technical missions. This article shows that the election observation journey of the AU has passed through several stages and regimes. While we recognise the challenges, we also point towards improvement, and identify the missing links that the AU needs to complete to become a truly independent actor in its election observation missions. ABSTRACT: The 2015 presidential election in Côte d'Ivoire was the first since multiparty elections were introduced in 1990 in which all major parties were able to compete without triggering a civil war. We examine the extent of democratic progress registered by this milestone election, focusing on three democratic qualities of elections: competition, participation, and legitimacy. Whereas competitiveness and participation measures both fell relative to the 2010 election, the 2015 election was contested by all major parties and its results were accepted peacefully, registering a dramatic step forward in the legitimacy of the electoral process and outcome. We support this conclusion with a historical analysis; and by comparing the final 2015 results with parallel vote tabulation for the 2015 election, Afrobarometer survey data from 2014, and a subnational analysis of voter turnout in 2015 relative to 2010. ABSTRACT: The Electoral Commission of Ghana (EC) has successfully managed five out of the six elections since the adoption of Ghana's 1992 Republican Constitution, which gave legal status to the country's democratisation process despite some administrative lapses over the years. The 2012 presidential election, however, served as a credibility test for the EC. In this paper my main objective is to analyse critically the Ghana 2012 election petition as an expression of mistrust in, and dissatisfaction with, the EC's performance. I argue that, at least in the case of Ghana, the success of an electoral process is largely a function of the human factor, not necessarily the legal frameworks and regulations in force. Using the theory of accountability, I analyse the role of temporary election officers in eroding public confidence in electoral processes. I also draw attention to some implications of Ghana's Supreme Court judgment on election administration in future. My recommendations include punishment for officers whose negligence causes avoidable political tensions, to demonstrate the state's determination to demand accountability from election officers on behalf of citizens. To support this argument, my study uses thematic content analysis of the petitioners' court affidavit, the court's judgment and legal opinions proffered through media outlets. ABSTRACT: This paper has two focal points. It undertakes a critical review of Nigeria's 2011 general elections vis-à-vis manifestations of violence across all the regions and zones of the country. It also attempts an in-depth and dispassionate overview of the nexus between democracy and violence. The paper infers that Nigeria is currently operating an �insecurity-based democracy' which can literally be called a �bunker democracy', allegorically describing Nigeria as a country where politicians and the electorate are in constant fear and trepidation for their lives when an election is imminent. I argue that this unwholesome situation should be addressed so that Nigeria does not suffer democratic regression and undue relapse to military autocracy and absolutism. ABSTRACT: Despite the growing speculation about the electoral power of poor voters, little is known about what influences them to vote the way they do and why. Poor communities are often considered a homogeneous group, with little appreciation for their agency in making electoral choices. In this paper, comparative data are shared from a quantitative study undertaken in two selected poor communities during 2013 in Johannesburg (Riverlea and Doornkop) and a rural community in the Limpopo province in 2014. Two key factors were explored that might explain voter preferences, namely identification and loyalty on the one hand, and on the other clientelism, social grants and vote-buying. Firstly, it was found that long-term party loyalty and party performance are the main predictors of voter preferences, irrespective of geographic location. Secondly, in all three areas, it is unlikely that the majority of poor voters will be persuaded to vote for a particular party on the basis of receiving food parcels before elections. Finally, the study showed that one in six voters would consider voting for a party that provides a social grant, with this trend being most prevalent in the African communities of Doornkop and Limpopo. Therefore, it could be argued that social grants can be used as a campaign strategy of gaining (or retaining) support from grant-holders and could influence the floating vote. ABSTRACT: In African elections, the period between polling and announcement can be protracted and tense. In the best cases, this intermission is marked by hopeful candidates urging tense supporters to stay calm. In the worst cases, such periods are used by politicians to hurl accusations of fraud back and forth to work up partisanship and devalue electoral institutions. The days between an election and its results are stressful because incomplete information about this constituency or that trickles out, but partisans have few systematic ways to compare these data with past results or exit polling, and worry that the missing data are somehow being tampered with. This paper shows how OLS regression using past results to fill in partial results can not only reduce uncertainty in the short term, but may also point out whether or not withheld results seem plausible. What began as a simple social media experiment is presented here as an elegant formula that accurately predicts outcomes across Ghana's Fourth Republic and in Nigeria's 2015 presidential election. This accuracy was achieved with as little as 10% of the results in, and extremely biased samples.